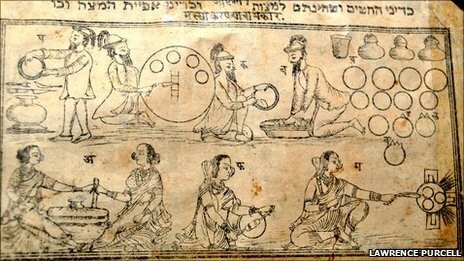 A rare haggadah used by the Bene Israel, one of the Jewish communities in India, was bought at a garage sale by a University of Manchester historian. A copy of the Poona Haggadah is at the Library of Congress, but the copy just purchased may be the only one in the United Kingdom. The text in the haggadah is in both Hebrew and Marathi, the language spoken by the Marathi people of western and central India and the official language of the state of Maharashtra.